Titan Old World Spanish A4 is a beautiful double roman profile tile which boasts a Class A fire rating and Class 4 impact rating, the highest standards set for roof tile. 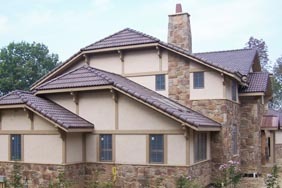 This barrel style tile is an excellent choice as an alternative roofing product to concrete tile or clay tile. As one of the lightest composite roofing tile on the market, Titan Old World Spanish A4 allows for tile re-roofing applications as well as new construction since it does not require added costly structural support. Titan Old World Spanish A4 is the only composite tile that is available in white as well as other solid colors and unique blends.